Posted on August 13, 2014 by On a Higher Note. Vivid Audio loudspeakers are designed for music lovers, audiophiles and homeowners that are “in the know” (#LoudspeakersInTheKnow) as every intricate detail in form is driven by its derived function, with museum quality aesthetics in mind. Vivid Audio is a continuous silent revolution. While many know about the original innovation, dating back to the B&W Nautilus, the innovations embedded in the Vivid Audio GIYA family are generations passed Laurence Dickie’s original invention. Vivid Audio flagship GIYA G1s have unofficially been updated and this writing is my attempt to summarize noteworthy improvements to-date, announcing (unofficially) that the second generation G1’s (and G2’s) are shipping now. Since the launch of the GIYA G1s in 2008, Vivid Audio’s designer, Laurence Dickie, embarked on a 5-year “Honey I shrunk the speakers” project, resulting in the debut of a smaller version of GIYA every other year. 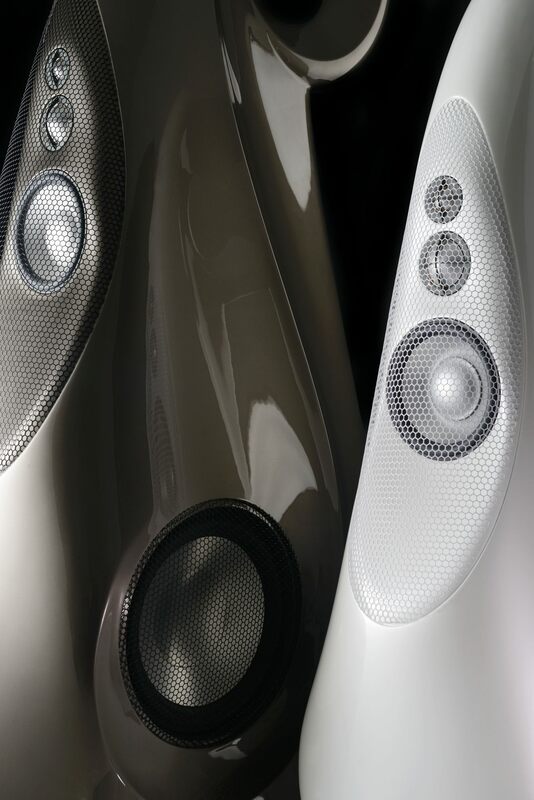 Starting with the G2, then G3 and concluded with the GIYA G4 speakers. Necessity is the mother of innovations. Everytime Dic shrinks the speakers, he took on new improvements in parts and sum of parts in order to continue to deliver the Vivid Audio GIYA sound in smaller and smaller packages. Last year, Vivid Audio unofficially started a major update of the flagship GIYA G1s to incorporate all technological innovations embedded in the GIYA family to-date, with many positive gains in performance, functionality and utility. Of note firstly, is the 0.75 db gain of efficiency for the overall G1 and G2 performance as a result of the new more efficient crossovers developed when designing the G3’s. These crossovers are mounted on a carbon fiber platform at the base of the cabinet. These new crossovers are now incorporated into all current GIYA speakers, delivering a consistent Vivid sound across the GIYA family line. The new G1 woofer cabinet apertures were altered to eliminate air pressure leakage. This change tightens up the cabinet considerably (essentially airtight), allowing the reaction-cancelling woofers to deliver the base performance they truly are capable of. Vivid Audio got rid of the plastic caps they used to use to protect the tweeters (the D26 and D50 drivers) from being damaged while they are being unpackaged. Instead they now place a soft foam cover that we only remove after the speakers are in place in the listening rooms. So what does that have to do with ridding coloration? You must read on. Turns out that in order to fit the old plastic caps on, the cavities of the cabinet were ever so slightly larger than what they need to be. Vivid Audio found that the difference was audible and could be seen on a spectrum analyzer. The aperture in the updated cabinet created a tighter tolerance that is both audible and measurable. In addition, internal bracing has been added in the cabinet, making the cabinet more inert and even less prone to resonance, giving an even tighter bass than before. Aesthetically speaking, GIYA is an artistic functional statement. Staying true to its commitment to bring to the market world class finishes, Vivid Audio recently adopted the world’s leading paint supplier, BASF, as their paint supplier. This allows Vivid Audio to offer matching paint finishes universally represented and specified by all major European automotive manufacturers. New high quality printed user guide with protective sleeve. If you want to hear your music the way the musicians and artists originally intended while making an enviable statement that you are one of the music lovers, audiophiles or homeowners “in the know” (#LoudspeakerInTheKnow”), give us a call or send us an email to arrange for an audition. This entry was posted in Latest News and tagged Vivid Audio.